Assessment reports are central to the diagnostic process and are used to inform parents, clients, and clinicians, among others, about academic problems, personality functioning, neuropsychological strengths and weaknesses, behavioral problems, and the like. Essentials of Assessment Report Writing provides handy, quick-reference information, using the popular Essentials format, for preparing effective assessment reports. This book is designed to help busy mental health professionals quickly acquire the knowledge and skills they need to write effective psychological assessment reports. Each concise chapter features numerous callout boxes highlighting key concepts, bulleted points, and extensive illustrative material, as well as test questions that help you gauge and reinforce your grasp of the information covered. This practical guide focuses on efficiently and effectively communicating referral and background information, appearance and behavioral observations, test results and interpretation, summary and diagnostic impressions, and treatment recommendations. The authors provide examples of both good and bad case report writing and highlight ethical issues and topics relevant to presenting feedback. 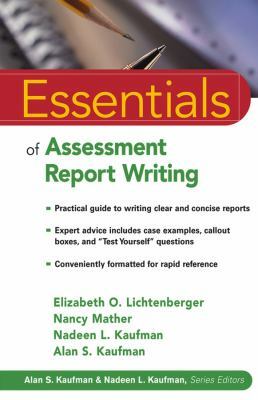 Essentials of Assessment Report Writing is the only pocket reference illustrating how to prepare an effective assessment report.